But in my mind I’m disorganized. And by this I mean that I feel disorganized. When I got an iPhone four years ago, I thought it would be better. With all the apps and calendars and organizational systems available, I decided that would be my salvation. I’d keep notes and calendar only on my iPhone. Then somehow all my notes got wiped out. Months of notes on my iPhone. Literally months. Luckily I was disorganized (or organized) enough that I didn’t miss them. That’s when I started the notebooks. Let me back up. For a year or so I’ve wanted to write a post about how organized I am. How I have this great notebook system that helps me be incredibly organized. But that was when I was developing this great notebook system, one that involves six seven eight I’m not sure how many notebooks of different shapes and sizes. Movies to watch. Books to read & books read (yes I consolidated these into one notebook a few years ago, thank goodness). Future writing project ideas. Blog notes—for my blog and for Writer Unboxed. Household tasks and future posts. Things that needed to be done right away. Daily writing journal. Current WIP notebook. Quotes. Agents. The small notebook I keep in my wallet for when I’m not at home. Now that the system is (pretty) developed, I’m not so sure. When I’m at home, it’s not an issue. I have the whole of the house at my fingertips. But when I work outside the house, at a coffee shop for instance (where I am right now), I scoop up an entire pile of things (and by things, I mean notebooks) I might possibly need (thank goodness it’s only a subset since I leave “home task notebooks” at home) and load them into my bag along with my laptop. The other problem is this. I’m not consistent. 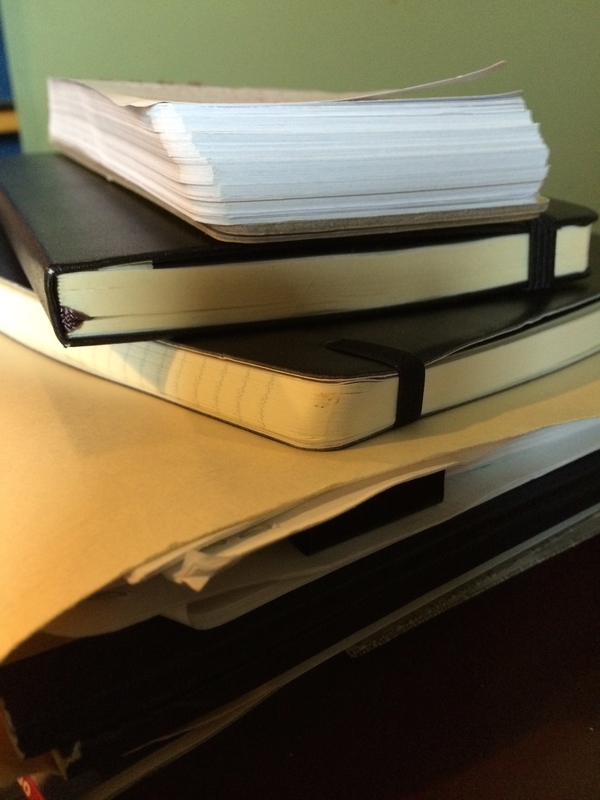 I don’t (necessarily) write things down in the right notebook, and the catch-all becomes the small spiral notebook next to my computer (if it happens I’m working at my desk)… or the pad of paper on the kitchen table (if I’m working there). And the phrase “you can’t take it with you” takes on a whole new meaning with the notebook system. When I’m working at a coffee shop, any old scrap of paper will do. Don’t even get me started on my calendar. Kitchen wall? iPhone? Post it stuck to the back door. Yes, all systems apply. And the other problem is that once I write something down—using the notebook system—I may or may not ever look at it again. So that leaves me with…why? Why do I do it? An act of passive resistance to being controlled by paper? Or phone? Not enough of a system?/Too much of a system? The fear of putting everything on my iPhone/computer for fear “out of sight is out of mind”? And/or losing notes again? Busy with writing so I don’t want to bother with the act of getting organized (that’s my favorite, by the way). The truth is I’m not sure why. This post has helped me to identify the overarching possibilities. Sometimes I wonder if the mere act of writing something down in one of the notebooks (or a scrap of paper) will help me remember, and maybe that’s enough. (I’ve actually read that for some kinds of learners this is true.) Sometimes the mere act of writing a blog post (like this) will help me figure things out. Or start me thinking about it and help me solve it. Maybe my system is too complicated. Maybe the real problem is the feeling that things are slipping through my fingers. Not that I’d be more productive if I remembered everything necessarily (whatever everything is), but that I would be happier and less stressed if I didn’t have to worry about it. Maybe I don’t really have a problem. Or maybe I can think about this tomorrow and for today it’s more of an attitude adjustment I need. Because maybe I am disorganized, but maybe I’m as organized as I need to be. For today. But tomorrow? Tomorrow’s another day. Maybe tomorrow I’ll be organized enough to figure out how to be even more organized. What about you? Are you an organized person? Any tips, ideas, apps, or suggestions you have for me?